Somebody likes Westlife a bit too much! No doubt Ebay Seller soodoo1199 took advantage of the Westlife mania that has been sweeping over the nation. This Fiat Punto caught the attention of dedicated Westlife fans after it went up for sale on Ebay. 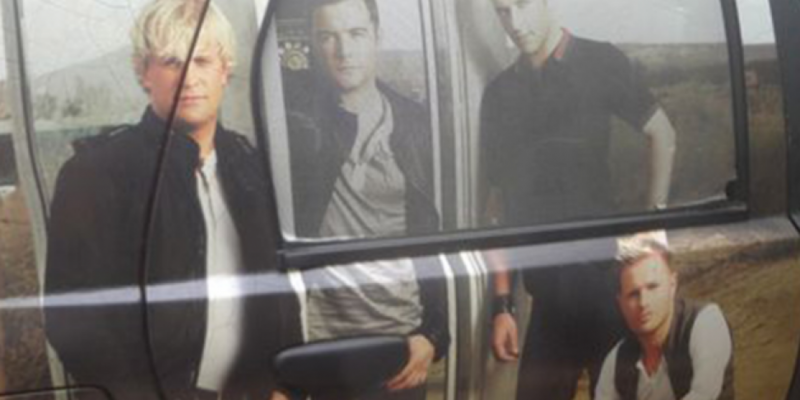 The owner had the Punto plastered with Westlife images, but she obviously has a soft spot for band member Shane Filan. The new owner will get to enjoy strange looks from passers by as the see Filan's huge photo on the bonnet of the car, not too mention his name on the windscreen and another photo of him on the roof! The bids started at £250 and had a staggering seven bidders fighting for their dream car. The winning bid was £360, bit much for a Westlife Punto?